“I am going to die!” Joani yelled. We each took turn to climb up the vertical passage inside the chimney rock. The indentations for foothold were quite shallow as it was worn off through the years. We were in Cappadocia, the the fairy-like cave world at Turkey. Cappadocia was one of the strangest sight we had seen yet on our trip, with various shapes of weird rock formations resembling from chimney to mushroom and to castles. Adding to these strange formation, more than 500,000 inhabitants carved into these rocks and also underground caves to live in or to hide from persecution starting more than 2000 years ago. As recently as 40 years ago, many of the cave networks were stilled fully inhabited. The five of us plus George, my close college friend from UCLA, had been hiking along this Star War-like rock valley for the last 5 hours. 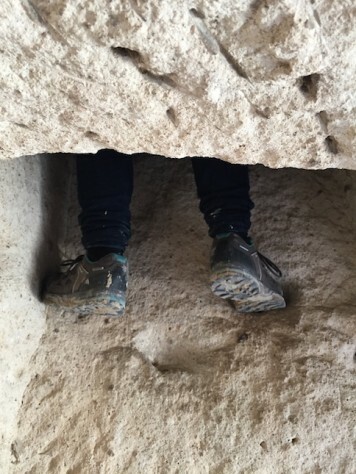 As we hiked, we saw abandoned cave churches, communities, winery, pigeon houses, stables, etc., all made from carving inside these sandstones of various colors mainly of red, rose, white, brown, and green. 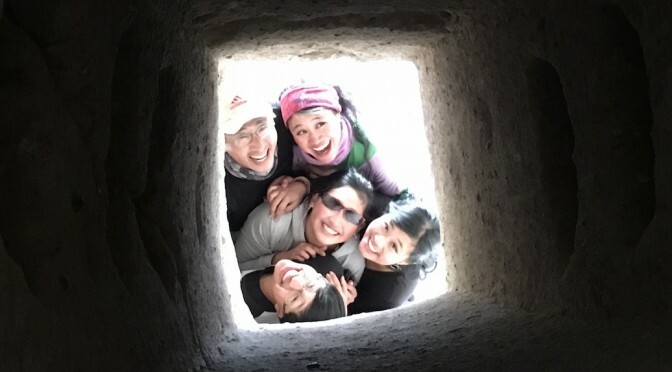 The hike was supposed to be jut few hours but we had so much fun exploring all the nooks and crannies of the caves and posing for photos that we had covered less than half of the original plan. 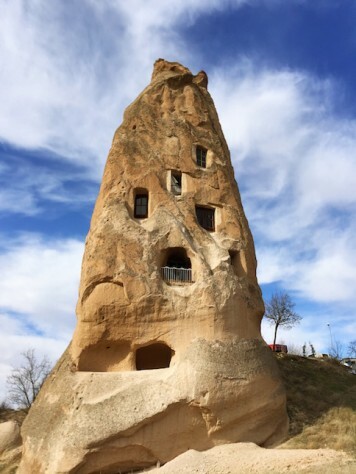 For centuries, people in Cappadocia lived in caves in such “chimney rocks”. 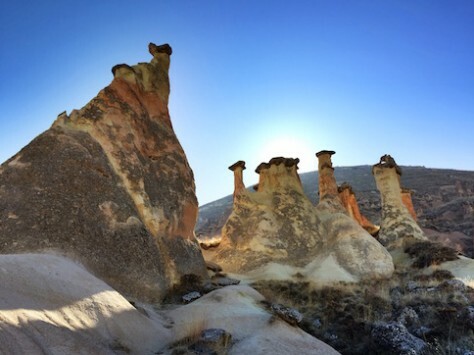 The rock formation at Cappadocia looked alien when observing from the ground up. 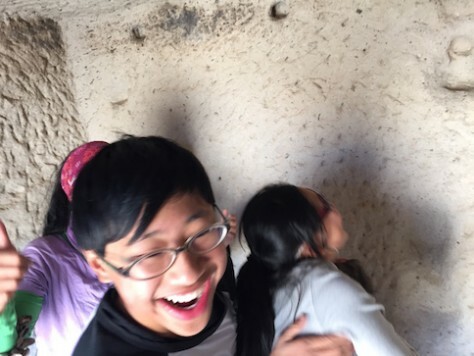 At the moment, there were six of us exploring the inside of this 6 stories high “chimney” rock that looked like a watch tower. Inside the rock chimney were carved two rooms on two floors, connected by a narrow half meter by half meter square-shaped “chimney” or shaft also carved into the rock. 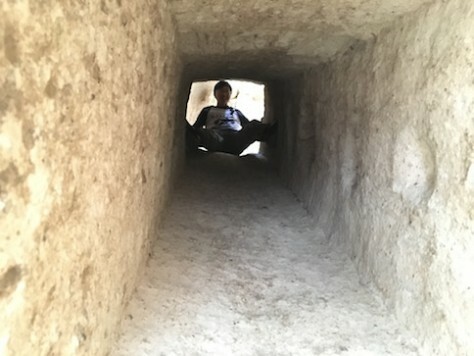 The shaft itself was about the height of two stories and there were indentations on the sides of the shaft for climbing up and down. However, after years of use and erosion, many of the indentation were barely visible. Except for Annie, we all took the challenge and squeezed, crawled, and lifted ourselves up the chimney onto the second floor. It was difficult so none of us wanted to climb down knowing that going down would be much harder than going up given our previous rock climbing experiences on this trip. The kids voted for me to go down first as the “guinea pig” to test out the water. Midway, I was stuck for a long time as I couldn’t feel any foothold for me to put my weight. I felt I might slip down the shaft any moment. Luckily, Annie was on the lower floor and could see the footholds. She tugged on my foot until my toes can feel the invisible foothold below. Now I was doing the same guiding Joani down the shaft. Joani’ toes finally reached the niched of the foothold overcoming the hardest part of the descend. Soon she jumped down onto the bottom floor. When each children climbed down from the shaft, each shouted with joy of relief. It was such an interesting change of perspective. At one moment, Joani was panicking, pleading for help being stuck in the chimney. At the next moment, as soon as her both feet were on solid ground, she was so happy that her first reaction was to celebrate, knowing how hard it was going to be for the three that are still not down yet. When Olivia finally came down, she was so joyful that she and Joani hugged each other tightly turning in circle as if they had not seen each other for years. 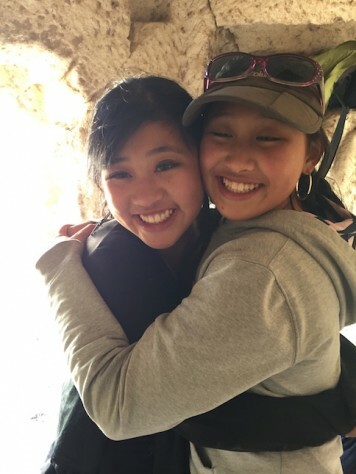 When Olivia finally climbed down from the shaft, she was so ecstatic that she and Joani hugged for joy. 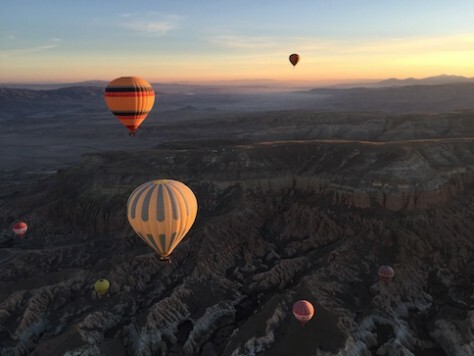 Similarly, our hot air balloon ride above the rock valleys of Cappadocia also gave us a different perspective. 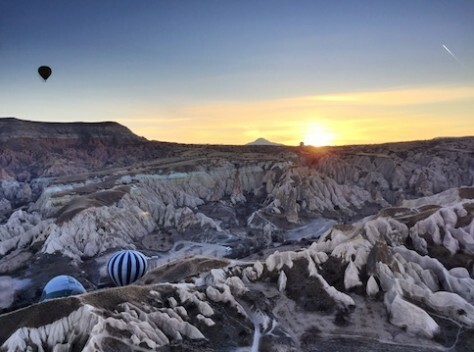 Cappadocia is known as one of the most beautiful place for a hot air balloon ride. 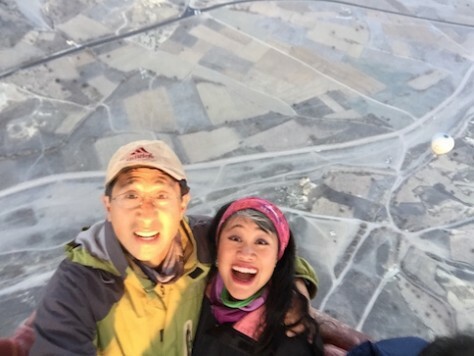 It was all of our first time on a hot air balloon. Totaling the cost for five persons, it was a luxury ride that we usually would not have taken if it was not for the generosity of a long time family friend. We woke up at 5AM to catch the sunrise on the hot air balloon. 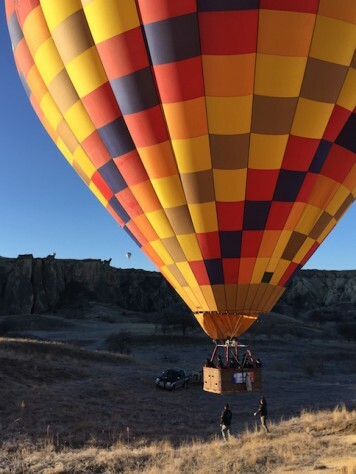 Although it was below freezing, the loud flame that heats up the air inside the balloon kept us warm as we ascended higher and higher above the valley floor. Riding on this colorful hot air balloon was one of our highlight of the trip. Due to low season, we rode on a basket for 8 persons that allowed us to ascend up and down the rock cliffs and ridges as the wind blew gently across the valley floor. Sometimes we were the highest balloon in the sky at more than 750 meters above and sometimes we were so low that we came within few arm-reaches of the rock cliffs around us. Sometimes the rocky valley looked like small erosions on a sandy beach when we were high. Sometimes the rock chimneys soared up tall and straight towards the sky when we were low. Either perspective, the view was indescribable especially when the sun beams just pierced over the horizon low across the rock formations and cave houses. The scenery was quite different when we were low in the valley versus high up in the sky. At Cappadocia, caves dwellings such as the one we saw on the hot air balloon were not only in chimney rocks, but also along cliffs, and even underground. It was estimated that there are more than 100 underground cities that housed hundreds of thousands of people at one time. 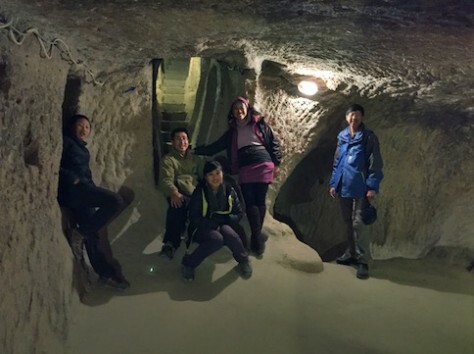 There are so many that our couchsurfing host in Urgup, Cappadocia told us that while they were building their cave hostel, they accidentally came upon an underground cities right underneath! 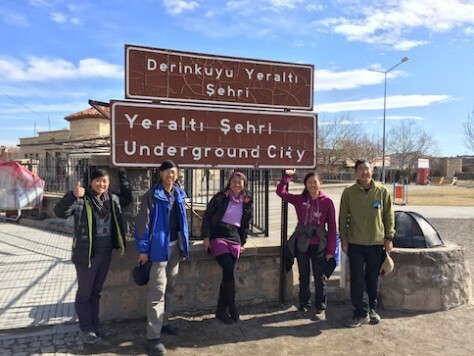 For many hundreds of years, Christians hid in these complex underground cities to avoid persecution from Muslims who came through Cappadocia, a strategic location along the Silk Road. We visited two of the larger underground cities that housed around 10,000 and 25,000 people with 8 to 12 levels deep below. Down several levels underground, we were amazed at the complexity of the underground city. All of us agreed. 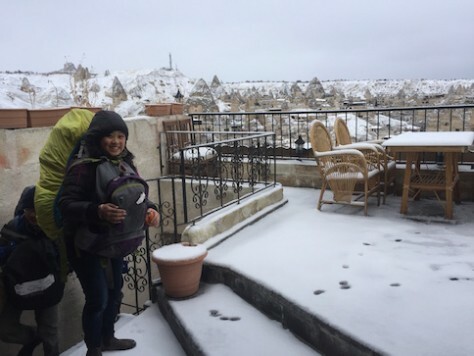 It was January and Cappadocia was minus 2-5 at night. We couldn’t imagine living in one of those holes with cold, bare stone walls. 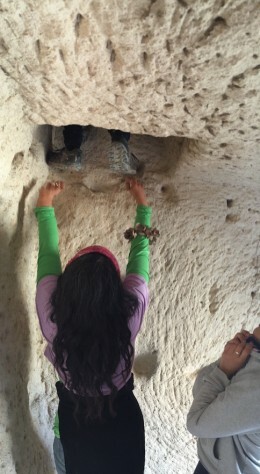 For centuries, people in Cappadocia lived in caves in such “chimney rocks”. When the caves are decorated, they are actually quite comfortable. 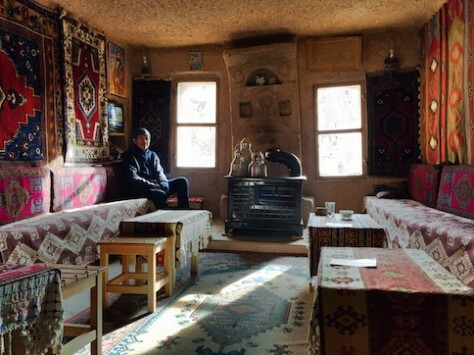 It was not until we visited a local’s cave home that now has turned into a tourist cafe next to the Uchisar Castle did we really understood what Aslan meant. “Sorry, the room is only used when friends come over,” The owner replied to our disappointment. Our cave hotel was built from an original cave house under the side of a cliff centuries ago. 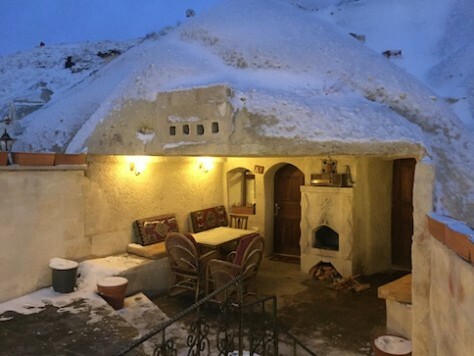 Luckily, my mother, who visited Turkey a year ago, offered to pay for one night for us to stay in a “cave hotel” in the town of Goreme. 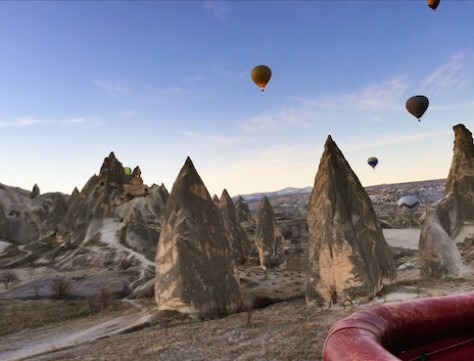 Of all the places in Turkey, she enjoyed Cappadocia the most and living in a cave hotel was one of her highlight. 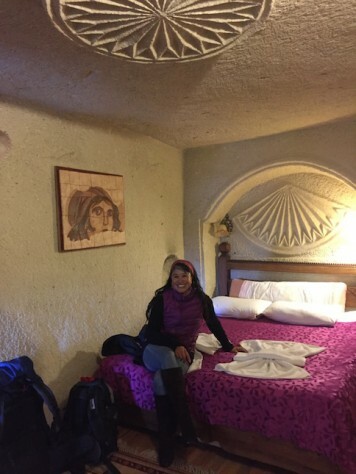 Paying for our one night stay at a cave hotel was her way of sharing her happiness and memory with us. It was snowing when we arrived at our cave hotel. Inside the cave hotel, the room was carved with beautiful rock decorations. We picked to stay at a cave hotel built right on the side of a mountain cliff up high, next to the sunset view point. It was snowing that day when we moved in and everywhere was covered with a beautiful white blanket of snow. Inside the “cave” there was everything we needed, a beautiful bed, shelve, windows, decorations carved into the wall, jacuzzi bathroom, and even a fireplace! Since it was Chinese New Year’s Eve, we decided to use our camping stove, borrowed a big pot from the hotel, and had a great Chinese New Year hotpot feast right at the opening of the cave rooms. We bought chicken, Turkish meat ball (kofta), cheese, potatoes, onion, garlic, letteus, tomatoes, and soup seasonings. It was delicious. Although it was minus five degrees, the atmosphere was heart-warming as we shared our memories from our travel with George the last month in Israel and Turkey. 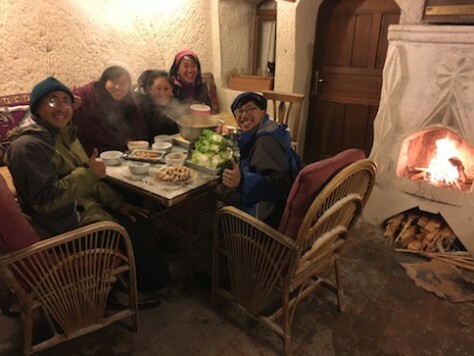 We celebrated Chinese New Year with a hotpot under the cave opening at -5C with a fireplace. It was 7AM on Chinese New Year and the clouds had lifted after a night of snow. The sky was perfectly clear and the warm sunrise rays shone brightly onto the whole scenery. I was admiring the snow perching on top of the chimney rocks when suddenly I heard a familiar roaring sound, “Hummmmm…Hummmmm”. When I looked up, my jaws dropped down in disbelieve. “Everyone, come out. It is so beautiful! You have to see this.” I yelled out to the whole family who were still sleeping under warm blankets after a whole night of late celebration counting down to the New Year. On Chinese New Year’s Day, we woke up to colorful view of hot air balloons right on our balcony. The sound I heard was from a hot air balloon right above me. The balloon was so close that I could hear the sounds of the flame and people’s voices. Then I looked up across the sky and saw an incredible view of thirty or forty color hot air balloons drifting high up all around our cave hotel. For two nights it has been snowing or the wind has been too strong. So on this first clear day, all the balloon came up in full force, making our stay at the cave hotel even more memorable. What a change of perspective from thinking of these caves as cold, damp, dark dwellings to five-star hotel rooms! We’ve made it to the sunset view point! Even our adventurous excursion on quad bikes through the rock valleys was a lesson in perspective. 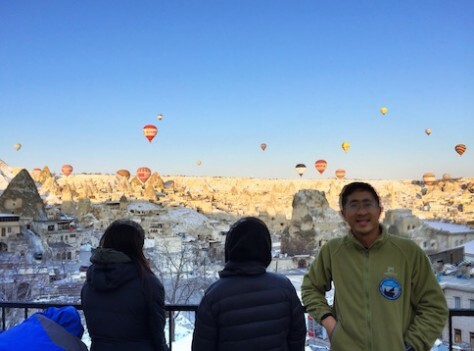 We didn’t plan to join a tour during our stay in Cappadocia due to our budget constraint. 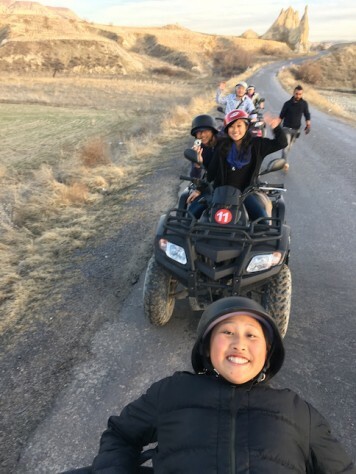 But while hiking towards a sunset viewpoint in Goreme, we passed by a quad bike rental shop by the side of the road with a big sign, “Sunset Tour”. Out of curiosity, I asked for the price. Surprisingly, it was only USD 16 per quad bike for a 2.5 hour excursion. Two persons can sit on each bike, meaning that it was only USD 8 per person! “But that was when I was only six and I only rode on it for a few seconds!” Joani protested, bringing back the scary memory of me allowing a six year old to ride on the bike even for a few seconds. “I was eight and I only rode on it for a minute,” Nathan added. 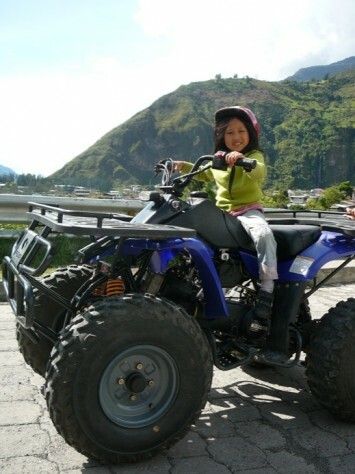 After 7 years, Joani rode on a quad bike for the 2nd time. With their pleadings and considering the good bargain, I relented and agreed. 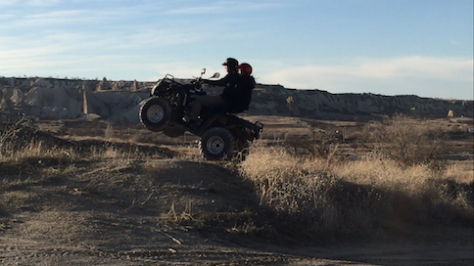 Deep down the adventurous side of me also couldn’t resist zooming down the dirt road on these cool looking machines. “Isn’t it interesting how perspective can be so different when you are in front versus when you are in the back?” I concluded. 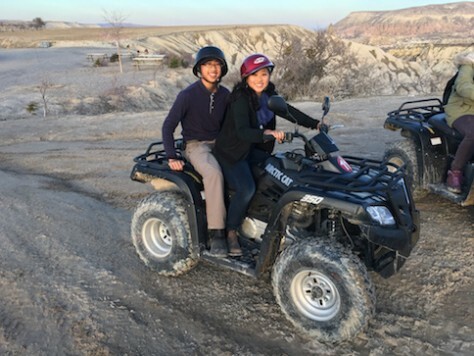 For Olivia, driving the quad bike versus riding behind Nathan was a different feeling. Nathan, the crazy teenager, flew into the sky on a quad bike with Olivia screaming behind him. No matter the perspective from the driver’s point of view or from the passenger, we were glad that we reached our sunset view point at the Love Valley safely (except for a Chinese tourist who panicked and drove straight down into a field). The sun was just setting, the champaign was popping, and we were busy doing all sorts of jumping and silhouette poses. Another Chinese family of three who were with us exclaimed that we took such interesting photos. Little did they know that after nearly 8 months of traveling and seeing beautiful sunset in countless exotic places, we automatically know how to pose for photos quickly during the few minutes before the sun disappeared down the horizon. After driving the quad bikes to the sunset view point, we posed for a family photo. Annie and I were glad to see how much our children had grown and matured in the seven years since they last drove the quad bikes. There were moments where their wheel were dangling in the air at the edge, where the bike tilted sideway down a steep slope, where the bike was swimming in the mud, and where Joani had to make a screeching stop just before hitting the bike ahead of her. Annie and I who were behind Joani almost had heart attacks. However, we were proud that they were so brave and so willing to go out of their comfort zones. We rode the quad bikes through various rock valleys. 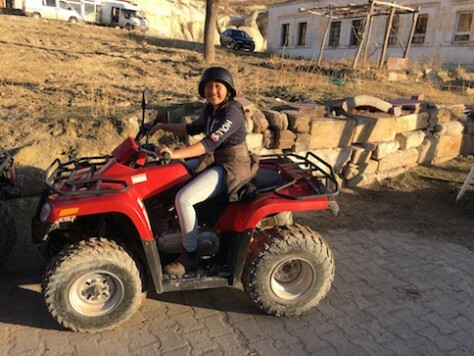 In Cappadocia, our perspectives were changed by climbing down the rock chimney, going up in the hot air balloon, living in the cave hotel, and riding on the quad bike. And changing our perspectives is why we are traveling for a year across the Silk Road! We caught the sunrise just as the hot air balloon rose up the sky. Very beautiful and interesting. Thank you for showing us this place that we would never, never see otherwise – but now we have experienced it through you-all. 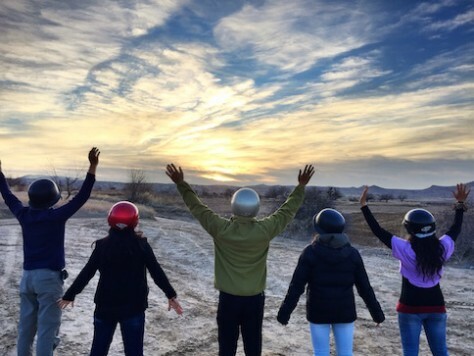 I am in awe of the adventure you and your family are experiencing! Having had “little dabs” of such experiences, I am thrilled beyond words for what you are doing AND for sharing it with all of us who would love to be stowed away in your back packs! Also, your photography is very professional, which reminds me of “a picture is worth a thousand words”, (A Chinese wise saying if I am not mistaken!) Be blessed and be safe!